Here are the basics about using the OneDrive app for iPhone, iPad, and iPod Touch. Download the app for iOS. Open the OneDrive app and tap the Me icon in the upper left of the screen. To switch between a personal OneDrive account and a OneDrive for Business account, or between multiple OneDrive for Business accounts, open the app, tap the Me icon in the upper left of the screen, and then tap the account name you want to use. You can add only one personal account to the OneDrive app. To open a different personal account, tap the Me icon in the upper left of the screen, tap the account you want to sign out of, and then tap Sign Out of This Account. Then, sign in with the account you want to use. Then tap to take a photo or video, or upload an existing one. If you choose Take a photo or video, your device's camera app opens. You might be asked if you want OneDrive to access your camera - tap OK to allow your pictures to be saved in OneDrive. If you tap Upload, links appear to the Photos app on your device. Browse to the pictures you want to upload, select them, then on the top bar, tap Done. Camera Upload can only be used on one account at a time. Photos uploaded through the Camera Upload feature will automatically be sorted by Year and Month into nested folders in the Camera Roll folder. This can be controlled by the “Organization” Settings in the Camera Upload settings page. Please note that moving, renaming, or deleting these folders is not supported or recommended at this time. In the OneDrive app, tap the Me icon in the upper left of the screen, then tap Settings . In the Settings box, tap Camera Upload, then turn on Camera Upload to automatically upload photos and videos to OneDrive. Note: To set your device to upload pictures even when the OneDrive app isn't the active app, tap Upload in Background. To make sure videos automatically upload, turn on Include Videos. All photos and videos will upload at their original sizes when you're on a Wi‑Fi network. If you want to use your mobile network, tap Settings, tap Camera upload, and then turn on Use Mobile Network. OneDrive cannot upload photos optimized for iCloud. To disable optimization, tap Settings > iCloud > Photos and uncheck Optimize Storage. Select the Me icon > Photos. Select either Whiteboard, Document, or Business Card, then tap the white circle icon to scan the item. Note: Files are automatically saved as PDFs. You can search for text within files and even photos. At the top of any file view, tap the Search box, and then type your search phrase. If you're working in a OneDrive personal account, a search includes only the contents of the folder you have open. For example, if a folder called Work Documents is open, search will look only at files in the Work Documents folder. To search all of your OneDrive files, use search in the Files view. If you are working in work or school account, a search always searches the entire OneDrive. You can add folders in the Files view, or in any other folder in OneDrive. In the view or folder where you want a new folder, tap Add at the top of the screen, and then tap Create a folder. Tap Folder name and type the name you want for the folder, then tap Create. Your Files list appears. Tap the folder you want the files moved to, then tap Move. Tap the Me icon in the upper left of the screen, select the account, and then tap Recycle Bin. Tap the Me icon in the upper left of the screen, tap the account you're using, and then tap Recycle Bin. Tap Delete to remove the files permanently. In the OneDrive app, open the folder that has the photos or videos you want to download. Make sure the folder contents appear in List view, not as thumbnails. Tap Share > Save Photo. Find your downloaded photos or videos in your device's Camera Roll folder. 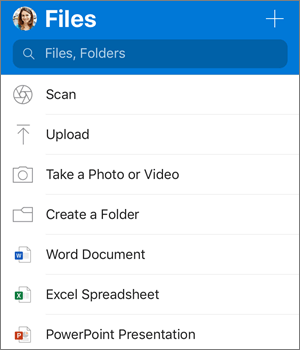 You can share files, photos, and folders in OneDrive on your iOS device, just as you can on a PC or Mac. To stop sharing, go to the OneDrive website and sign in with your Microsoft account, or with your work or school account. 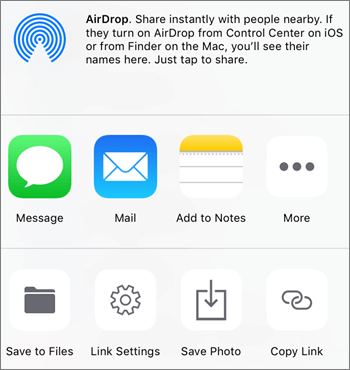 When someone shares a OneDrive file or folder with you, you typically get an email message or a notification on your iOS device. 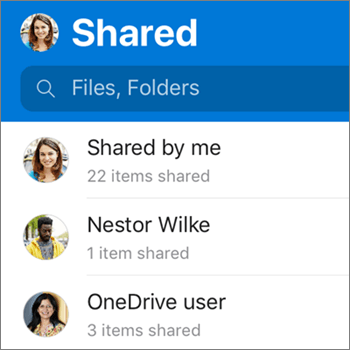 To find the files shared with you in the OneDrive app, tap the Shared view icon at the bottom of the app. Mark files or folders "offline" to read them anytime, even when you aren't connected to the Internet. Online edits made to the files sync the next time your iPad, iPhone or iPod Touch connects to the Web, so you get the latest version of the file. Files or folders marked offline are read-only - you can edit them only when you're online. To edit an Office file while offline, you’ll need to open the file while online in the required Office app. You can work on it offline after you've opened it. In the OneDrive app, select the file or folder that you want available for offline reading, then tap Keep offline . Tip: Once you mark a file or folder offline, OneDrive also lists it in an Offline Files view. Tap the Me icon in the upper left of the screen, tap Offline Files to instantly find all your offline files and folders. In the OneDrive app, tap the Me icon in the upper left of the screen, and then look at the Storage Space line to see your total storage and space available or to purchase additional storage. You can set a four-digit passcode to prevent other users of your device from accessing your OneDrive account. To do this, open the app, tap the Me icon in the upper left of the screen, tap Settings > Passcode, and then tap the Passcode toggle to turn it on and to enter your passcode. 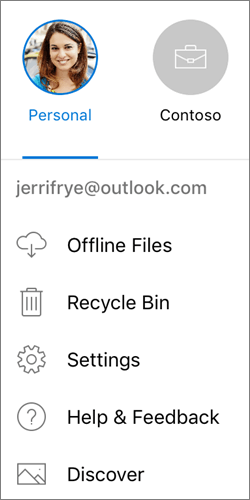 To sign out of a personal OneDrive account or a OneDrive for Business account, open the app, tap the Me icon in the upper left of the screen, and select the account you want to sign out of. Once you've selected the account, tap Settings > Personal or the OneDrive for Business account name > Sign Out of This Account. Open the App Store, and then tap Updates. If updates are available, tap Update All. You might be asked to enter your Apple ID password. If you still have problems with the app, try deleting it and then going to the App Store to download it again. For more help, read how to Troubleshoot OneDrive for iOS app problems. You can rate the OneDrive app when you view it on an iPhone, iPad, and iPod Touch, or get help, by shaking your device.